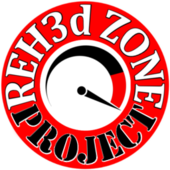 Welcome to The Reh3dZone, home of MatoPride! This page is all about giving things a good try. You'll see 3d printing, CNC machining, designing, modeling, and much more. Check me out live @ www.twitch.tv/reh3dzone Come join the fun and go all out with me! BTW if you're interested in helping support The Reh3d Zone, consider becoming a patron @ Patreon. And as always, please feel free to tag me on anything you print of mine @Reh3dZone on most socials.